Plants have evolved diverse mechanism to avoid herbivory. While many researchers focus on induced resistance our research focuses on aspects of induced tolerance, specifically induced resource sequestration. This research promises to expand our understanding of how plants defend themselves against herbivores. 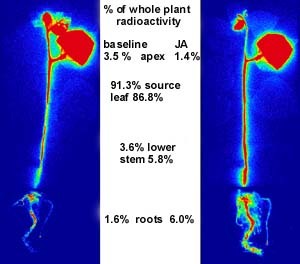 In collaboration with colleagues at Brookhaven National Laboratory, we used short-lived radioisotopes to non-invasively examine the dynamic responses of plants to herbivores. More recently we used stable isotopes to quantify changes in pool sizes. Currently, we are combining metabolomics with traditional measures of total N, protein and starch to quantify how specific resources decrease and increase in different tissue types. We have demonstrated that herbivore cues cause greater export of resources from local and systemic leaf tissue and this results in an increase in resource pools in stem tissue. More recent work has examined the conditions that are expected to favor resource allocation as compared to growth and defense. Overall this work highlights the importance of taking a whole plant perspective when examining how plants defend themselves against herbivores.